UCView makes it super-easy to spread the word about possible dangers in big places. Take a look at a new app that could save many lives. Most people have mobile phones, laptops, tablets, everyone is online, we are all connected to a network most of the day, but that doesn’t help that much when emergency situations happened. People in the past didn’t think about it that much, but today, when cards have changed and threats are behind every corner, we have started thinking about ways to overpass them. In this time of information, it is crucial to have the right ones at the right time. There are a lot of glitches that still occur when trouble comes, but they are about to disappear. Meet a new app that uses digital signage to easily solve this problem. 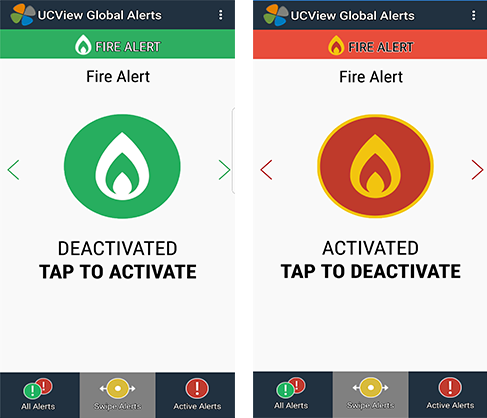 UCView Global Alerts is an application made for Android and iOS, which makes all this possible. Its capability of connecting to UCView servers or UCView Cloud SAAS allows for emergency information to be broadcasted on all of the displays, or just some groups of them, depending upon the importance of the information. This can be done in a matter of seconds, by a simple press of a button in the app. You can activate the warning or an alert, and the usual message on the displays will be replaced by a warning. Global Alert is very simple to use and quick to respond, which puts it in the first line of defense when emergencies happen. This handy tool is especially useful in corporate building, campuses… all in all, places with a lot of people in a space where a lot of damage can be done. So how does this work in real life? It’s pretty amazing, actually: imagine a situation in which a campus security guard spots a problematic situation. It would probably take at least a few minutes to get the word out to his immediate surroundings, and even more time to spread it to all the people that are at a possible risk. Now, with Global Alerts, he can inform the entire campus about a threat with just one press of a button in the app. All the displays can show that message and warn everybody. Everything in the app is automatic and the network operators don’t have to be in their usual workplace, they can broadcast a mass emergency alert using a handheld device, API or remote computer. Global Alerts also allows for text, video, and sound to be implemented into alerts, so it can make them more effective or easier to spot. This UCView app is a real problem solver. Making sure the word about danger gets to many people at once has never been so easy. With a simple interface and a fast response time, it is a life saver that is a must under all circumstances.